It is hard to blog in my current circumstances, but as a kind friend sent me a copy of Marco Polo: From Venice to Xanadu by Laurence Bergreen I think I might write something about it, if only to keep the blog alive as its second anniversary approaches (this will also be the sixtieth post and the end of the first cycle). Hopefully I will be able to get back to serious blogging again sometime soon, and I have some interesting Christmas and New Year specials lined up, so do keep tuned in. Bergreen's book was only published a couple of weeks ago, and as I only received it in this morning's post (three days ago as I hit the 'Publish' button) I have barely had time to page through it. But casually leafing through the book during my lunchtime respite I stopped immediately at page 137, where I was confronted with the very familiar (and entirely uncredited) image of the table of Phags-pa letters that is to be found on Simon Ager's Omniglot page. Simon created the image using my BabelStone Phags-pa Book font so it is of course quite elegant, although it is a shame that he omitted the subjoined letters YA and WA, which are considered to be integral members of the original set of forty-one Phags-pa letters—I leave it as an exercise for the reader to work out which four letters in the table are not part of the original set of letters devised by the Phags-pa Lama [2008-01-12 : Omniglot has now been updated to fix this omission]. Below (at least they were below this paragraph before I started opening the book at random and finding all sorts of niggling errors) are the relevant extracts from the book, with Bergreen's peculiar misuse of the word language where he means script highlighted in bold (it's not as if he does not know what a "script" is, as he uses that word several times as well). The statement that Phags-pa is a constructed language rather than a constructed script is particularly infelicitous, and I suspect that a general reader of these pages would come away with a very confused idea of what the 'Phags-pa language was. 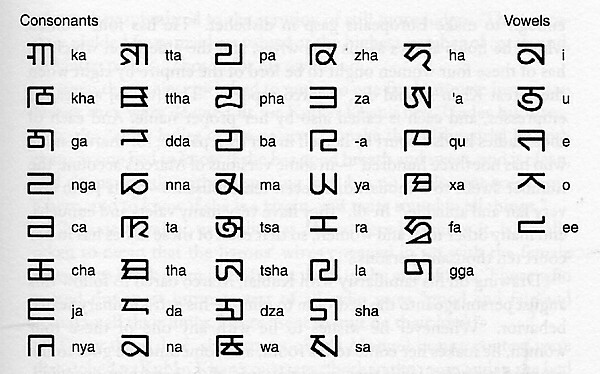 For those of my readers who don't already know, it was not a language but a set of letters based on the Tibetan script that could be used to phonetically transcribe various languages, principally Mongolian and Chinese—and as such it has been called the IPA of its time (in retrospect I remember that I argued against calling Phags-pa a "universal script" in my comments to Abecedaria's post on Genghis Khan). Obviously linguistics and such is not Bergreen's strong point—elsewhere in the book (page 222) he states that "the Chinese written language of the time contained about seven thousand characters", which as everyone knows is a vast underestimate of the true figure. Even though 6,000-7,000 characters seems to be a fairly popular estimate of how many characters a modern educated Chinese speaker recognises, this has little bearing on the number of characters in use 700 years ago. In fact Yuan dynasty vernacular Chinese was particularly rich, and included many characters not used in classical Chinese, some of which are not even to be found amongst the 70,000+ CJK ideographs already encoded in Unicode (just this weekend, whilst researching for my New Year's blog post I came across an unencoded character <⿰土引> meaning "obstruction", which is used frequently in a not very obscure Yuan dynasty treatise on a certain popular pastime). And whilst I'm in a critical mood, does anyone else think it odd that Bergreen refers to Kublai Khan's capital (modern Beijing) as Cambulac (307 google hits) instead of the more usual Cambaluc (16,700 google hits) throughout the book (see especially page 141) ? The etymology, from Turkic Khanbaliq "city of the Khan", would suggest that Cambaluc is more correct than Cambulac, and the sources I have to hand give Cambaluc (Yule translation), Chanbalu (The Travels of Friar Odoric), Cambalec (Recollections of Travel in the East by John de' Marignolli and The Book of the Estate of the Great Caan by the Archbishop of Soltania) and Cambaliech (Letters of John of Montecorvino and Letter of Andrew of Perugia), so either Bergreen is following some other source or this is just a typo that nobody noticed. But if it is a typo it is indicative of the editorial care that this book is missing. In keeping with his aspiration to become the "universal emperor," Kublai sought to encourage a common written language for all the peoples of his empire. 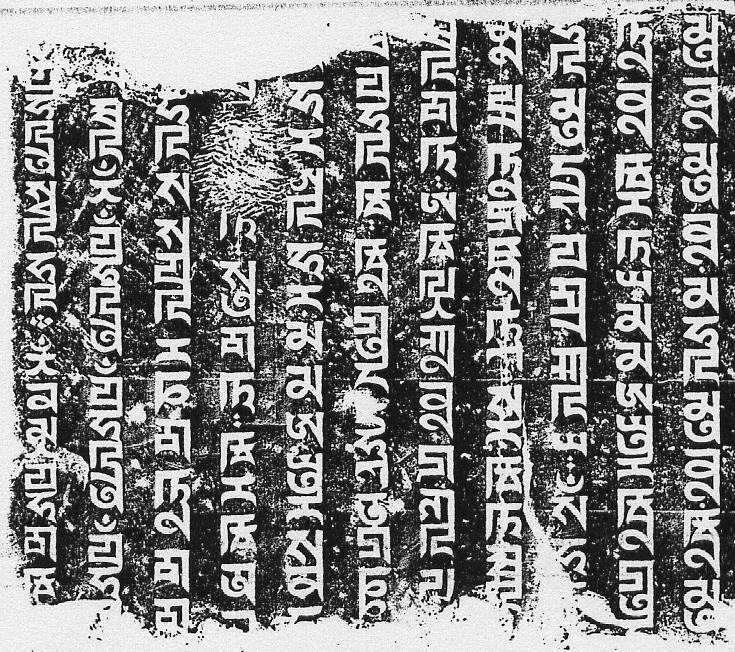 To bring order to the chaos of Mongol communication, he commissioned an influential Tibetan monk named Matidhvaja Sribhadra to devise an entirely new language: an alphabet capable of transcribing all known tongues. Endowed with prodigious intellectual gifts, the monk was said to have taught himself to read and write soon after birth, and could recite a dense Buddhist text known as the Hevajra Tantra from memory by the age of three. As a result of these accomplishments, he was called 'Phags-pa, Tibetan for "Exceptional One." 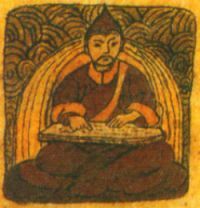 having arrived at the Mongol court in 1253 as an eighteen-year-old prodigy, 'Phags-pa later found special favor with Kublai Khan's principal wife, Chabi, and came to exert a profound influence over the court. The system transcribed the spoken Mongolian tongue with more accuracy than its impoverished predecessors, and even recorded the sounds of other languages, notably Chinese. Kublai Khan proudly designated this linguistic innovation as the language of the Mongol officialdom, and he founded academies to promote its use. The Mongolian Language School opened the same year, and two years later, the National University. 'Phags-pa script appeared on paper money, on porcelain, and in official edicts of the Yuan empire, but scholars and scribes, devoted by sentiment and training to Chinese, Persian, or other established languages, resisted adopting it. Nor did Marco demonstrate familiarity with the new Mongolian idiom. In 1274, about the time the Polo company arrived in Mongolia, 'Phags-pa retired to the Sa-skya-pa monastery in Tibet, where he died in 1280. By that time, his version of Buddhism was falling into disfavor with the Mongols, and his clever script had failed to catch on, except among a small number of adherents who employed it on ceremonial occasions. It remained a worthy but failed experiment in artificial or constructed language. Laurence Bergreen, Marco Polo: From Venice to Xanadu pp.136-137. Aside from the linguistic terminology used by Bergreen, one other possible cause for confusion here is the name of the protagonist, who Bergreen calls Matidhvaja Sribhadra, probably following the lead of Omniglot (which is top of a list of less than two dozen pages on the entire internet that use this name for the Phags-pa Lama). The Phags-pa Lama's given name in Tibetan is in fact blo-gros rgyal-mtshan བློ་གྲོས་རྒྱལ་མཚན (pronounced lodro gyaltsen), which means "Wisdom Banner of Victory" (blo-gros means "intellect, intelligence, wisdom, understanding", and rgyal-mtshan means "banner of victory"—one of the eight auspicious symbols). In the Mongolian script his name is written phonetically as lodoi ǰaltsan ᠯᠣᠳᠣᠢ ᠵᠠᠯᠼᠠᠨ, and in the History of the Yuan Dynasty it is transcribed using Chinese characters as luógǔluósī jiāncáng 羅古羅思監藏. Matidhvaja is the direct Sanskrit equivalent of this name (mati = blo-gros, and dhvaja = rgyal-msthan), but Sribhadra is a title meaning "the glorious and excellent", equivalent to the Tibetan term dpal bzang po དཔལ་བཟང་པོ (transcribed in Chinese as bānzàngbo 班藏卜), so calling him "Matidhvaja Sribhadra", as if it were his given and family name, is perhaps not ideal. Later on he became known simply by the Tibetan title 'phags-pa འཕགས་པ "noble or exalted one", which was represented in Chinese characters as bāsībā 八思巴 (and several other variants), and is variously romanized as 'Phags-pa, Phags-pa, ḥP'ags-pa, hPhags-pa, vPhags-pa, Phagspa, Pagspa, Phagsba, Pagsba, Passepa, Phagpa, Phakpa, Pakpa, etc. etc. (I prefer Phags-pa). In contemporary Chinese sources he is more often referred to by the title guó shī 國師 "Imperial Preceptor". In Khubilai Khan, pages 40-41 and 155-160, Rossabi ably tells the story of 'Phgas-pa and his script. See also Jack Weatherford's Genghis Khan and the Making of the Modern World pages 205-206. And Zhijiu Yang's [楊志玖] Yuan shi san lun [元史三論] has an interesting discussion of the languages Marco Polo may have known or used, with reference to M. G. Pauthier's thoughts on the subject. Marco Polo's Asia, by Olschki, also discusses 'Phags-pa script and contains interesting assessments, pro and con, of the Mongol impact on Chinese culture (pages 124-128). All reputable print sources, I am sure, yet it is clear that Bergreen has learnt much about the Phags-pa script from Simon Ager's Omniglot site (the top site if you google for 'Phags-pa), so why does he not provide a link to Omniglot or to other sites dedicated to the Phags-pa script ? Surely pointers to the internet are far more useful to most readers than dry references to stale books that probably require a visit to the library to access or the expenditure of a fair amount of money. Maybe it's all just authorial snobbishness—Bergreen, like all of us, finds the internet to be an indispensible research tool but would not want any of his readers to know that (preserving the myth that knowledge is something that can only be attained from dusty libraries and by actually travelling to China and Mongolia, and is not something that ordinary folk can simply pick up for free from the internet). Although it is good to see that Mr. Bergreen considered the Phags-pa script important enough to dedicate a couple of pages to it, I think that he missed an opportunity to discuss in a little more depth than he did how the script was a unifying force across the vast Mongol empire—examples of the script have been found on artefacts from the banks of the Volga (a fragment of birchbark manuscript dating from the time of the Golden Horde Khanate, 1240-1502) to the shores of Japan (relics of Kublai's Khan's failed invasions of Japan). Instead Bergreen repeats the tired clichés about the script being a failed experiment that was hardly used despite being mandated as the Mongol empire's official writing system. I, on the other hand, would have emphasized the wide range of uses that the script was put to in both public and private life, for writing languages as diverse as Mongolian, Chinese, Uyghur, Tibetan and Sanskrit. But despite the wealth of material that is written in the Phags-pa script and the abundance of artefacts that have Phags-pa inscriptions on them, I still feel very dissatisfied with what we have, and what is now lost gnaws at me constantly. What for instance of Persian, the second language of the Mongol empire ? Even though there is a special Phags-pa letter ( U+A865 PHAGS-PA LETTER GGA ꡥ) that is unused in Chinese , Mongolian, Uyghur, Tibetan or Sanskrit, and appears to be intended to represent a glotal stop for use in writing Persian (i.e. the letter 'ayn ع), not a single example of Persian written in the Phags-pa script is known. I am sure that there must once have been Persian Phags-pa texts, just that none of them have survived. But not a single page of any Phags-pa edition of any of these books is known to have survived. I have got a competent knowledge of the language and character which is most generally used by the Tartars. And I have already translated into that language and character the New Testament and the Psalter, and have caused them to be written out in the fairest penmanship they have ; and so by writing, reading, and preaching, I bear open and public testimony to the Law of Christ. And I had been in treaty with the late King George [leader of the Öngüt Turks], if he had lived, to translate the whole Latin ritual, that it might be sung throughout the whole extent of his territory ; and whilst he was alive I used to celebrate mass in his church according to the Latin ritual, reading in the before mentioned language and character the words of both the preface and the Canon. I have now had six pictures made, illustrating the Old and New Testaments for the instruction of the ignorant ; and the explanations engraved in Latin, Tarsic, and Persian characters, that all may be able to read them in one tongue or another. 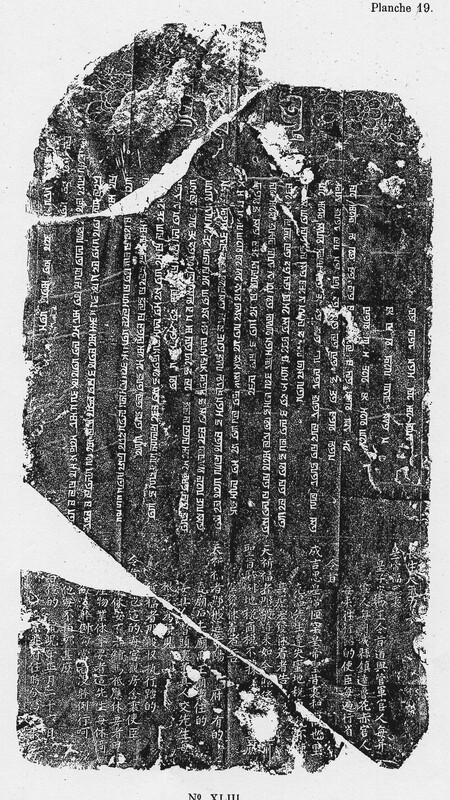 Here is direct evidence that Franciscan missionaries in Cambaluc (modern Beijing) were printing Christian tracts with the text written out in different languages and scripts. Here the word Tarsic has been generally taken to mean the Old Uyghur script, so it is not quite evidence of the use of the Phags-pa script, but John remained in Cambaluc until he died in about 1328, and the Franciscan presence in China continued until the end of the Yuan dynasty in 1368, so there was a period of over sixty years during which the Franciscans would undoubtedly have been printing books and pamphlets in order to spread the word of God to all the different nationaities of the country. But not a trace of any of these missionary tracts have survived. But if we turn away from the capital, Cambaluc, to the great haven of Zayton (modern Quanzhou) on the east China coast we do find solid evidence of the use of the Phags-pa script by Christians. 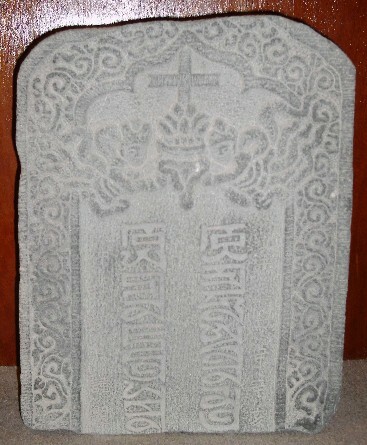 A large number of Christian tombstones have been found in Quanzhou, mostly with inscriptions written in the Uyghur language using either the Syriac script (example) or less commonly the Uyghur script (example), and these are without doubt memorials to members of the Assyrian church ("Nestorians") who originally came from the western parts of the empire. Many similar tombstones with Syriac inscriptions have also been found in the west of China and elsewhere in central Asia. However the inscriptions on four tombstones found at Quanzhou are in the Chinese language written in the Phags-pa script, and the names of the deceased are clearly Chinese. Furthermore, whereas the Syriac and Uyghur tombstone inscriptions generally include overt Christian text, typically starting with "In the name of the Father, the Son, and the Holy Spirit..." in Uyghur, these four tombstones have no explicit Christian content other than the image of the cross and angels, but use exactly the same forms of wording that are found on ordinary non-Christian Chinese tombstones of the time, just with the main inscription spelled out phonetically in the Phags-pa script rather than being written in Chinese characters (it is perhaps worth pointing out that as far as I am aware no non-Christian Phags-pa tombstone inscriptions are known). It has always been assumed that these four Phags-pa tombstones are also for members of the Assyrian ("Nestorian") church, but I wonder if it is not more likely that they are associated with the vibrant Franciscan mission in Zayton, which was the only Catholic bishopric outside of Cambaluc. 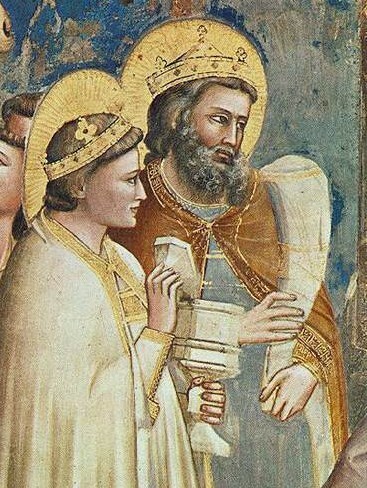 We know of a succession of bishops of Zayton, including Gerard (c.1308-1313), Peregrine (1313-1322), Andrew of Perugia (1322-1332), Nicholas of Paris (c.1332-?) and James of Florence (?-c.1362), and the Phags-pa tombstones are dated 1311, 1314 and 1324 (and one undated), which makes them contemporary with the early Franciscan mission in Zayton. It seems to me that the most plausible explanation for using the Phags-pa script on the tombstones of Chinese Christians is that they were converts of the Franciscan mission, and that as the European friars could not read or write Chinese characters they promoted the Phags-pa script is the medium for reading and writing Chinese amongst their congregation. And what about Marco Polo ? Did he also know and use the Phags-pa script ? Bergreen says that there is no evidence that he did, and that is true enough, but to my mind it would seem quite probable that in fact he did, as it would have been the easiest and most useful script to learn. So, if European merchants and missionaries in China were using the Phags-pa script, one tantalising question is, did knowledge of this script filter its way back to medieval Europe ? The answer, according to some scholars, notably Hidemichi Tanaka, is yes, there was some knowledge of the Phags-pa script in medieval Europe. In a 1306 illustration of the Robe of Christ in Padua, the robe not only was made in the style and fabric of the Mongols, but the golden trim was painted in Mongol letters from the square Phagspa script commissioned by Khubilai Khan. ... Old Testament prophets were depicted holding scrolls open to long, but undecipherable, texts in Mongol script. 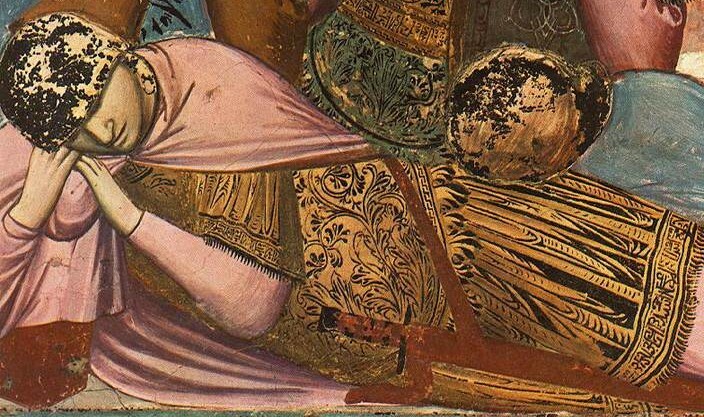 The direct allusion to the writing and clothing from the court of Khubilai Khan showed an undeniable connection between Italian Renaissance art and the Mongol Empire. The National Gallery of Art more cautiously states that these are "pseudo-inscriptions [which] blend letter shapes derived from Arabic and the Mongol Pags-Pa script". I would concur with this description. 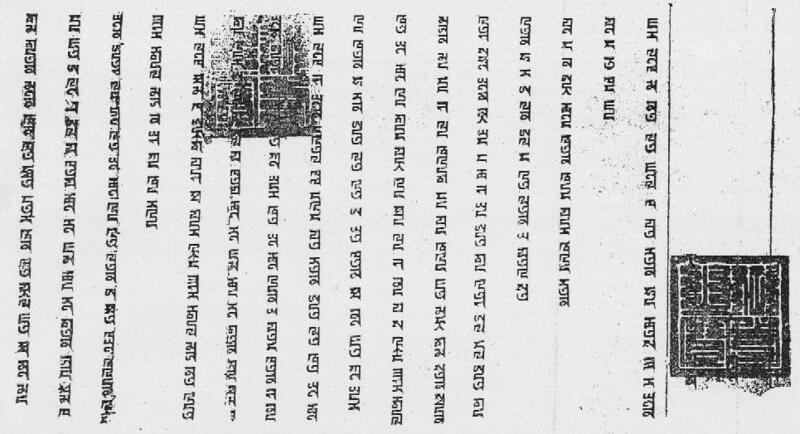 Although some of the "letters" could be construed as being Phags-pa (there is something which looks quite like Phags-pa letter YA in the picture of the Madonna), they do not follow a vertical flow along a stemline as is the case with both the Uyghur-Mongolian script and the Phags-pa script. Instead they appear to have no fixed orientation, with "letters" jumbled horizontally and vertically into square packets. My impression is that the decorative motif shown here is a simulacrum of oriental writing, and that any resemblence of "letters" in the pattern to individual Phags-pa letters is probably coincidental. 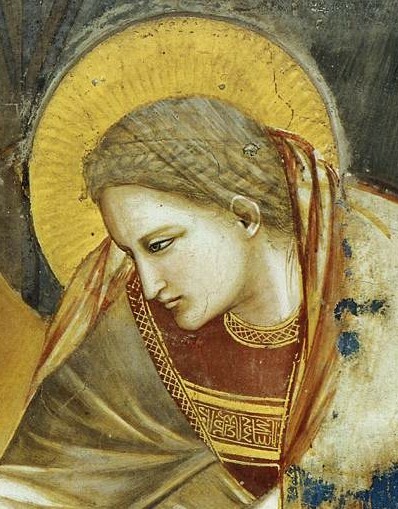 Which is not to say that Giotto did not model these motifs on Phags-pa and other scripts that he saw on souvenirs such as bank notes brought back from China, but I do not believe that the motif is sufficiently faithful to say that Giotto incorporates the Phags-pa script into his paintings. Incidentally, on the script-like motif in the Resurrection of Christ there is something which looks remarkably like the Chinese character 西 xī "west", which leads me to my readers' challenge for the week : what is the earliest depiction of a Chinese character in a European book or manuscript or painting ? I have no idea what the answer is, so please let me know what you think. For printed books, the earliest example I can find on my shelves (only a copy unfortunately) is the magisterial De Ludis Orientalibus (Oxford, 1694) by Thomas Hyde (1636-1703) which includes the earliest detailed descriptions in Europe of both Shahiludio Chinensium (xiangqi 象棋 or Chinese Chess) and Circumveniendi Ludo Chinensium (weiqi 圍棋 or Go, but written as hoy ki 囬碁 by Hyde). I am sure my readers can go a lot further back than this though.